Not to be confused with Peć, Peč, or PECS. For other uses, see Pecs (disambiguation). Pécs (Hungarian pronunciation: [peːt͡ʃ] ( listen); known by alternative names) is the fifth largest city of Hungary, located on the slopes of the Mecsek mountains in the south-west of the country, close to its border with Croatia. 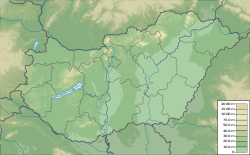 It is the administrative and economic centre of Baranya County. Pécs is also the seat of the Roman Catholic Diocese of Pécs. Its episcopate was founded in 1009 by Stephen I, and the first university in Hungary was founded in Pécs in 1367 by Louis I the Great. (The largest university still resides in Pécs with about 34,000 students). Pécs was formed into one of the cultural and arts center of the country by bishop Janus Pannonius, great humanist poet. Pécs has a rich heritage from the age of a 150-year-long Ottoman occupation, like the mosque of Pasha Qasim the Victorious on Széchenyi square. Pécs was historically a multi-ethnic city where many cultural layers were encrusted melting different values of the history of two thousand years. In 1998 Pécs was given the UNESCO prize Cities for peace for maintaining the cultures of the minorities, and also for its tolerant and helping attitude toward refugees of the Yugoslav Wars. In 2007 Pécs was third, in 2008 it was second Livable city (The LivCom Awards) in the category of cities between 75,000 and 200,000 inhabitants. The earliest name for the territory was its Roman name of Sopianæ. The name possibly comes from the plural of the Celtic sop meaning "marsh". 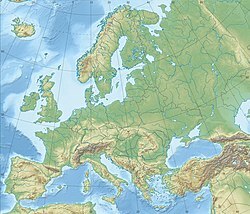 Contrary to the popular belief, the name did not signify a single city, and there are no traces of an encircling wall from the early Roman era, only from the 4th century. The name Pécs appears in documents in 1235 in the word Pechyut (with modern spelling: pécsi út, means "road to/from Pécs"). In Turkish "beş" (pronounced [beʃ]) means 5. The name is first recorded after the Mongol invasion of Europe. In other languages: in Latin, Quinque Ecclesiae; in Croatian, Pečuh; in Serbian, Печуј / Pečuj; in Slovak, Päťkostolie; in Czech, "Pětikostelí"; in Dutch Vijfkerken; and in German, Fünfkirchen. Pécs is open from the south. Mecsek lifts up to 400–600 meters (1,312 to 1,969 ft) from the Pécsi plain of about 120–130 meters (394 to 427 ft). Jakab-hill, located in western Mecsek, is 592m (1942 ft) high, Tubes, straight above Pécs, is 612 m (2008 ft), and Misina is 535 m (1755 ft). Higher parts of the city climb up to 200–250 m (656 to 820 ft), mainly Pécsbánya, Szabolcsfalu, Vasas and Somogy. Graveyards pulled back to a relatively small area. Woody areas generally start from about 300 m (984 ft) height. Mecsek is divided by several valleys which have key role in ameliorating the climate of the city without lakes and rivers. Waters coming down from Mecsek are collected by Pécsi water under the east-west rail road leading them eventually to the Danube. According to György Györffy's theory from place names, after the Hungarians conquered the Carpathian Basin, they retained a semi-nomadic lifestyle changing pastures between winter and summer and Árpád's winter quarters -clearly after his occupation of Pannonia in 900- were perhaps in Pécs. Later, Comitatus of Baranya was established, the capital of the comitatus was not Pécs but a nearby castle, Baranyavár ("Baranya Castle".) Pécs, however, became an important religious centre and episcopal seat. In Latin documents, the city was mentioned as Quinque Ecclesiae. Around 1000, the area was inhabited by the Black Magyars. The Deed of Foundation of the Diocese of Pécs was issued in 1009. Peter Orseolo , the second king of Hungary was buried in the cathedral in 1046. The location of his grave is unknown. This is because in 1064, when King Solomon made peace with his cousin, the later King Géza I, they celebrated Easter in Pécs. Shortly after the cathedral burnt down. The cathedral that stands today was built after this, in the second half of the 11th century. In 1459, Janus Pannonius, the most important medieval poet of Hungary became the bishop of Pécs. He strengthened the cultural importance of the city. After occupying the city, the Ottomans fortified it and turned it into a real Ottoman city. The Christian churches were turned into mosques; Turkish baths and minarets were built, Qur'an schools were founded, there was a bazaar in place of the market. For a hundred years the city was an island of peace in a land of war. It was a sanjak centre in Budin Eyalet at first and Kanije Eyalet later as "Peçuy". In 1664, Croat-Hungarian nobleman Nicholas Zrínyi arrived in Pécs, with his army. Since the city was well into the Ottoman territories, they knew that even if they occupy it, they could not keep it for long, so they planned only to pillage it. They ravaged and burned the city but could not occupy the castle. Mediaeval Pécs was destroyed forever, except the wall encircling the historical city, a single bastion (Barbakán), the network of tunnels and catacombs beneath the city, parts of which are closed down, other parts are in possession of the famous Litke champagne factory, and can be visited today. Several Turkish artifacts also survived, namely three mosques, two minarets, remnants of a bath over the ancient Christian tombs near the cathedral, and several houses, one even with a stone cannonball embedded in the wall. After the castle of Buda was wrested from Ottoman rule in 1686, the armies went to capture the rest of Pécs. The advance guards could break into the city and pillaged it. The Ottomans saw that they could not hold the city, and burnt it, and withdrew into the castle. The army led by Louis of Baden occupied the city on 14 October and destroyed the aqueduct leading to the castle. The Ottomans had no other choice but to surrender, which they did on 22 October (see Siege of Pécs). During World War II, Pécs was captured by Soviet troops of the 3rd Ukrainian Front on 29 November 1944 in the course of the Budapest Offensive. The city suffered only minor damages, even though a large tank-battle took place 20–25 kilometres (12–16 miles) south of the city, close to the Villány area late in the war, when the advancing Red Army fought its way towards Austria. Zsolnay Museum. The House from the 13th Century. A good example of the city's history and interesting past can be seen in the main square, where the Gazi Kasim Mosque still stands, and, although consecrated as a church following the retreat of the Ottoman Turks centuries ago, the crescent moon and cross of Islam are still visible on the cupola. Indeed, Pécs is the richest town in Hungary in terms of Turkish architecture, with the ruins of Memi Pasa's Baths and the mausoleum of miracle worker Idris Baba, just two other notable remains. The Cathedral (11th century, renovated in the 19th century). University of Pécs (1367), building of the Faculty of Humanities in Ifjúság street. It includes a Botanical Garden. Klimo Library (1774). The first public library in Hungary, which was founded by bishop George Klimo. National Theatre of Pécs (Nemzeti Színház), inaugurated in 1895. The majority of the citizens with 84.0% are Hungarians according to the 2011 census. The city's Germans are the largest minority with 4.2%. Followed by the Roma (2.0%), the Serbs (0.2%) and the Romanians (0.2%). The largest religious group is the Catholics with 39.7% Roman Catholic and 0.3% Greek Catholic. The second largest denomination is the Calvinists (5.2%), the third the Lutherans (1.3%). 27.8% of the population is non-religious. Historically Pécs was well known in Hungary for its industry with several factories, but after the fall of the Iron Curtain many have not managed the economic transition well and went bankrupt (e.g. Pécsi Kesztyűgyár, Pécsi Bőrgyár, Littke Pezsgőgyár etc.). Until some years ago, it had a coal and uranium mine, now only its sand mine exists and is operated by the Hungarian-owned Quartz mining company. The nationally (and to a limited extent internationally) famous porcelain factory, the Zsolnay Porcelain is the greatest pride of Pécs. The walls and roofs of several public and private buildings in the city are decorated with the company's porcelains contributing to Pécs's unique cityscape. The Pécsi Sörfőzde (Pécs Brewery) is one of the four main Hungarian breweries (the others being Dreher Breweries, Borsod Brewery, Heineken Hungária), but the only one of them owned fully by Hungarians. It produces a special beer, that is known for not being strained before bottling. The Hungarian textilmanufacturer Rovitex Hungária, the American crane manufacturer Terex, the Hungarian scale manufacturer Pécsi Mérlegstúdió, the Hungarian furniture manufacturer Megyeri Bútor, the Hungarian cutting-tool manufacturer FORSZ, the German switchboard manufacturer HB-Kapcsolószekrénygyártó (part of the Bader Gruppe), the Hungarian recycling company Alcufer, the Hungarian agricultural vehiclemanufacturer HIDROT, the Hungarian animal husbandry tool manufacturer Önitató, the tobacco factory Pécsi Dohánygyár (owned by British American Tobacco), the Hungarian automotive spare parts manufacturer Matro, the Hungarian safe manufacturer Strauss Metal, the Hungarian packaging machine manufacturer SOMAPAK, the Hungarian plastics producer Termoplast, the Bocz Printing House, the Hungarian pickles manufacturer Babina, the Hungarian plastic product manufacturer Karsai Pécs, the Hungarian metal manufacturer Riner Metal based there and have their production facilities in the city. There is a gradual development of modern high-tech industry, with Finnish electronics manufacturing company Elcoteq the largest industrial employer in the city, the Hungarian Z Elektronika electronics manufacturer and the Hungarian TG Netcom IT network manufacturer. The German transportation company, Dachser has a logistics centre in Pécs. The Biokom waste management and recycling company (owned by the city) is responsible for the transport and recycling of waste in the whole territory of Pécs and the surrounding areas. The energy used in the settlement is produced mainly by the two biomass power plants of Pannonpower (part of Veolia) which consists of a 49,9 MW woodchip-fired and a 35 MW agricultural by-product-fired powerplants. The country's largest solar cell field is also in Pécs, thanks to the city's southern location and longer sunny hours, which can produce about 10 MW energy a year. The solar power plant is operated by MVM Hungarowind (part of the MVM Group). The Expo Center Pécs Exhibition and Conference Centre provides place for international exhibitions and conferences. The University of Pécs was founded by Louis I of Hungary in 1367. It is the oldest university in Hungary, and is among the first European universities. In the recent past it used to be divided in two universities, one for Medicine and Orthodontics (POTE) () and a larger one for other studies: JPTE (Janus Pannonius Tudományegyetem). The POTE (Pécs University Medical School, now known as the Medical School) has a large English program for general medicine and dentistry (with students from America, Asia, Africa, and European countries - including many Scandinavians) and a new German program. On 1 January 2000 these universities were combined under the name University of Pécs (acronym: PTE - Pécsi Tudományegyetem - University of Pécs). The City Council of Pécs is made up of 27 members of which 19 belong to the Fidesz majority led by mayor Zsolt Páva. Fidesz policies in Pécs have included a law making Homelessness illegal (2014) and an official call to property owners not to make space available for an NGO supported by OSF (2017). Main railway station of Pécs. Route 66: Pécs - Kaposvár. Although during the last decade connecting main routes inside the city has been an ongoing project, because of their insufficient lengths, this could not free the city from cross traffic. The recently inaugurated M6 motorway may prove to be a solution for this problem. Pécs is connected to Budapest through Pusztaszabolcs, and has direct connections to Mohács, Nagykanizsa. Designed by Ferenc Pfaff, the main railway station was built in 1900 and became a listed building in 2008. The building itself was built in the style of Renaissance Eclecticism, and it features reliefs depicting James Watt and George Stephenson designed by Klein Ármin and made by Zsolnay factory  The building is rather dilapidated, however, renovation was commenced in late 2011  A mass transit hub -including a bus terminal, a bus stop and a cab rank zone- is situated on the square in front of the railway station. Mercedes and Ikarus buses provide the only form of public transport in Pécs, though a tram line did operate from 1913 to 1960, when it was shut down due to changing transportation policy. Most of the remnants of this older system have been removed, though a few rails may still be seen around the city. Recently, the possibility of a new tramway was again discussed, Pécs having joined the Civitas program with Debrecen. Due to expense this plan was not realized, although analysts claim that the structure of the city and the intensity of its traffic could make a tramway an efficient mode of public transport. In 2010, the city council proposed opening a study for a new tramway. In the most idealistic situation, however, said tramway would only open in 2014. A new airport opened in Pécs Pécs-Pogány International Airport in March 2006. Its main traffic is supplied by smaller charter planes. As of June 2010, there will be aerial transportation from Pécs to Korfu and Burgas (Bulgaria). It will be the same plane (Embraer 120) with about thirty passengers aboard as before, during the previous summers. Károly Balogh Mankóbüki president of the Royal Court of Pécs. The city also has an informal friendship link with Peterborough, England. ^ "Pécs - Tisztségviselők" (PDF). ^ "OECD - FUNCTIONAL URBAN AREAS IN OECD COUNTRIES: HUNGARY" (PDF). ^ a b c d "Detailed Gazetteer of Hungary". www.ksh.hu. ^ "Pécs, a kultúra városa". Pécs, a kultúra városa. ^ "Early Christian Necropolis of Pécs (Sopianae)". UNESCO. 'UNESCO'. 2015-03-03. Retrieved 2015-03-03. ^ "Pécs, a toleráns város - Hetek Közéleti Hetilap". Hetek Közéleti Hetilap. ^ "BETA – Pécs-Baranyai Kereskedelmi és Iparkamara". www.pbkik.hu. ^ "Már építik a pécsi Búza téren a Corsót - BAMA". ^ Slovenská reč: časopis pre výskum a kultúru slovenského jazyka - Google Knihy. Books.google.sk. 1998. Retrieved 2013-03-12. ^ Kft., BioDigit. "Mecsek-hegység - Lexikon ::". www.kislexikon.hu. ^ Climatological Information for Pecs, Hungary, accessed 6 April 2012. ^ Viktor, Gyimesi (26 July 2016). "Tele van Pécs az iparoscsaládok örökségeivel - pecsma.hu". ^ "Quartz Kft - Bemutatkozás". quartzkft.hu. ^ "A stílusod egyedi, kívül, belül - Pécsi Sör". pecsisor.hu. ^ "Új gyártócsarnokot kap a pécsi Rovitex Hungária Kft. - BEOL". ^ butorlapszabaszat.hu. "Megyeri Bútor Kft. – bútorlapszabászat – Pécs - Országos Bútorlapszabászat és Lapszabászat kereső". butorlapszabaszat.hu. ^ "FORSZ Ltd. -". forszkft.hu. ^ "Bemutatkozás — Alcufer Kft". www.alcufer.hu. ^ Kft., Markcon Informatikai. "HIDROT Kft. » Cégbemutató". hidrot.hu. ^ "Rólunk – Matro". matro.hu. ^ "Rólunk - Strauss Metal Kft. Biztonságtechnika kis és nagyker, Páncélszekrény, széf, lemezszekrény gyártás, Lemezvágás, Lemezmegmunkálás, lézervágás, élhajlítás". www.straussmetal.hu. ^ "Somapak - History". somapak.hu. ^ "Company review - TERMOPLAST Műanyagfeloldgozó Kkt". www.termoplast.hu. ^ "Bocz nyomdaipari Kft. – Ofszet- és digitális nyomda Pécsen". bocznyomda.hu. ^ Kft., Markcon Informatikai. "Pannon Flavour". pannonflavours.org. Archived from the original on 2018-10-11. Retrieved 2018-05-08. ^ "Karsai Pecs Kft. Company Profile - EMIS". www.emis.com. ^ Web-E. "Riner-Metal Kft". riner.hu. ^ "Z Elektronika Kft". zelektronika.eu. ^ "TG Netcom Kft. - Our company". www.tgnetcom.hu. ^ "Pannonpower - Tevékenységünk". Archived from the original on 2018-05-09. Retrieved 2018-05-08. ^ Zrt., REGON Média. "Óriási naperőmű épült a pécsi hőerőmű helyére". ^ "Expo Center Pécs". www.expocenterpecs.hu. ^ "Pécs – Hungarian Spectrum". hungarianspectrum.org. Retrieved 2018-02-28. ^ "Pécs bans homeless from public areas". The Budapest Beacon. 2014-09-26. Retrieved 2018-02-28. ^ "Pécs adopts declaration calling on property owners to refrain from renting property to OSF grantee". The Budapest Beacon. 2017-12-14. Retrieved 2018-02-28. ^ "Március 31-én átadják az M6-os autópályát - BAMA". ^ "Időre elkészül az M6-os autópálya - videó - BAMA". ^ napilapcsoport.hu. "Pécsi Napilap". www.pecsinapilap.hu. ^ "Októberben kezdődhet el a pécsi főpályaudvar felújítása | Közélet | Baranya | bama.hu BAMA". Bama.hu. Retrieved 2011-09-15. ^ "Minden nap gyereknap!". www.regiostart.hu. ^ "Újra villamosról álmodnak a városházán - BAMA". ^ "Ismét indulhatnak chartergépek - BAMA". ^ "Partner Cities of Lyon and Greater Lyon". © 2008 Mairie de Lyon. Archived from the original on 2009-07-19. Retrieved 2009-07-17. Wikimedia Commons has media related to Pécs. 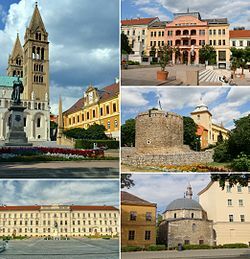 Wikivoyage has a travel guide for Pécs.